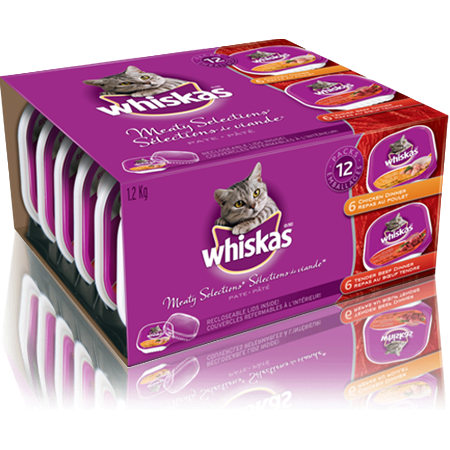 WHISKAS® MEATY SELECTIONS® Variety Pack Contains 6 x 100g WHISKAS® Chicken Dinner and 6 x 100g WHISKAS® Tender Beef Dinner. WHISKAS ® Recloseable Tray MEATY SELECTIONS ® is rated 4.6 out of 5 by 47. Rated 4 out of 5 by YVONNEWAB_347676004 from My small bengal female cat Nico, she is 84yrs old now and really likes the Whiskas chicken and beef dinner wet food 100g packs. I found that she may eat like half in the morning and the other half in the later afternoon, to keep it from drying out I put it in the refrigerator after she eats some in the morning until she's ready to eat more in the afternoon. I give her the wet food every other day as I prefer she also continue having her dry food too, so yes I would recommend the Whiskas wet food. She likes it very much and being she's an older cat (although she acts like a kitten often) has no ill effects going from whiskas wet food to her usual dry food! Rated 5 out of 5 by CAROLYNRON_347523803 from My two picky cats' normal wet food is Whiskas Perfect Portions fed twice daily. They like to have different flavours in each feeding. I never considered buying this larger formula thinking that they would not take the remaining amount later the same day. WRONG! They loved both flavours and I had clean dishes after both feedings. No difference in costs to feed them. Would definitely buy this product. Rated 5 out of 5 by ELENASBC_347523092 from I thought it was a really good product - especially the packaging. I have 3 cats and I could give them a treat each. The cats seemed to like it as well. I don't think they like the pate the first time I gave it to them, but I noticed that the second and third time they were more enthusiastic. I bought some more and I think it is a good value for the price I paid. 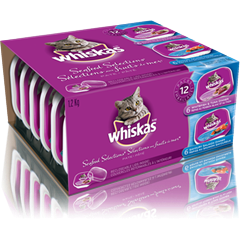 Rated 5 out of 5 by CORNELYAKON_347680011 from I bought the WHISKAS� Meaty Selections� Tray 12 Variety Pack (12 x 100g) about a week ago and my cat seems to like it very much and eats it right away and leaves almost nothing on her plate. I like that this product comes in a variety pack so that there is something new for my cat in the morning and evening to keep things interesting. Rated 4 out of 5 by ARAICAMYT_347668387 from I have 3 cats and they all seemed to like the product however none of them finished it. They licked all the gravy, ate a bit and left the rest behind. They don't eat a lot of soft food so this result is due to their tastes not the product. They did all come running every time I opened a can so they must have liked it somewhat. Rated 5 out of 5 by LESLIEMNS_347640798 from I have two cats one indoor and o e outside. Neither cat has ever like wet food and always wastes it. Both cats not only liked the product but finished it off and were anxious for more. I am pleasantly surprised as I have tried for years. First wet food they liked!! Excellent product. Convenient packaging as well. Rated 5 out of 5 by MEAGANMNS_347528181 from I have 3 cats, one of which is on a specialty diet that has rendered her very picky so I was surprised when she ate these. For me, that's a win in and of itself. The other 2 also ate it and there didn't seem to be any problems in general, no one was sick afterwards to I would recommend this product. Rated 5 out of 5 by LINDSAYCBC_347625148 from My cats can sometimes be a little picky (pate only, no chunks in gravy! ), but they both loved the Whiskas Meaty Selections. There was no hesitation at all when I gave them the first container. I will definitely buy Whiskas wet food again, and will try out the Seafood Selections next time. WHISKAS® Recloseable Tray MEATY SELECTIONS® is formulated to meet the nutritional levels established by the AAFCO cat food nutrient profiles for growth and maintenance.